Restaurant hopping for an entire day in Kapitolyo, Pasig was just the original plan. But when everyone thought that it will be a long day of food and conversations, the idea to spend a staycation near the area popped up. 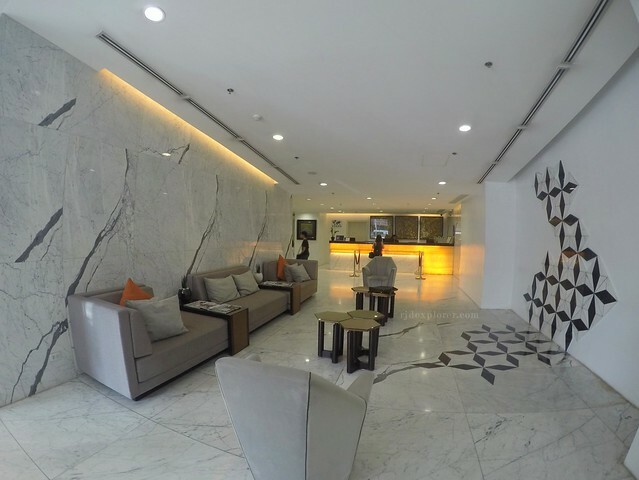 We iterated all hotels near Kapitolyo and settled with the most convenient one, Privato Hotel. Impressive lobby of Privato Hotel. 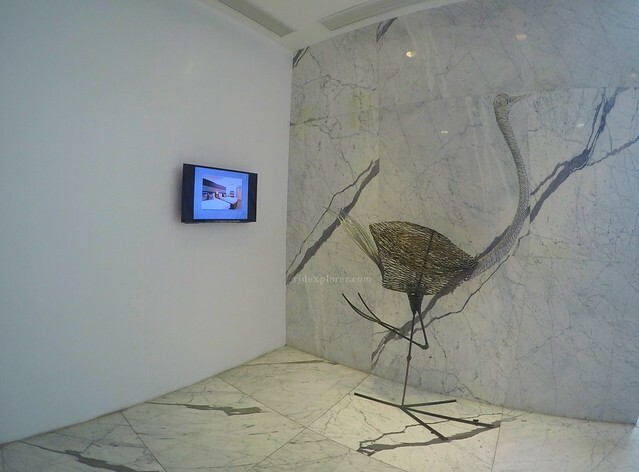 The lobby was designed to impress from the diamond patterns creeping from the floor to the walls, life-size ostrich metal sculpture created by Davao artist Ann Pamintuan, the classy furniture, to the striking reception featuring three artworks of recycled-paper artist Wataru Sakuma. Life-size ostrich metal sculpture by Ann Pamintuan. Standard check-in time is 2PM so we took a short break from the gastronomic feast we were having to see our room and leave some of our stuff. The front desk was busy at that moment so we patiently waited on queue. The small lounge area plus the numerous sets at the Cookie Bar were full so I decided to fall in line instead. The check-in process, not that quick but still efficient, lasted for just 10 minutes after some verifications and filling-in of necessary forms, queuing time included. Privato Hotel’s Executive Twin room. 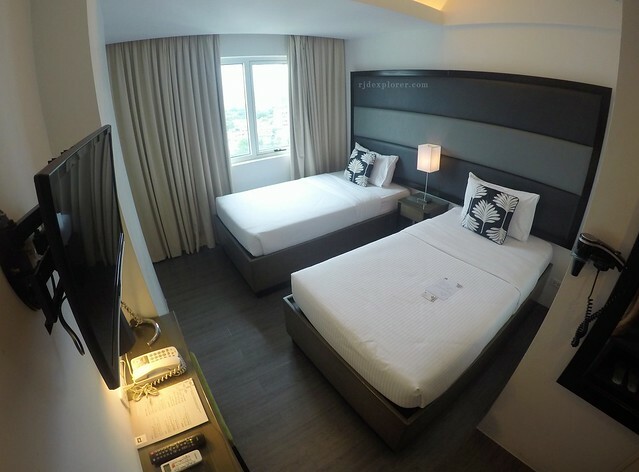 The 21-square meter Executive Twin room we got is on the 11th floor and we were so happy to find out that it’s facing south with Bonifacio Global City, Makati, and some part of Ortigas on our view from the window. 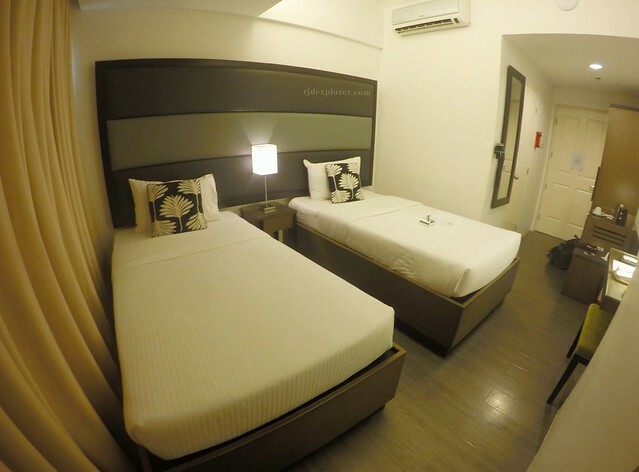 The air-conditioned room has two twin-sized beds, as expected, a cable-enabled television with articulating wall mount for different angles of viewing, telephone, a mini-bar, coffee and tea making facility, and in-room safe. Executive Twin Room and its bathroom. 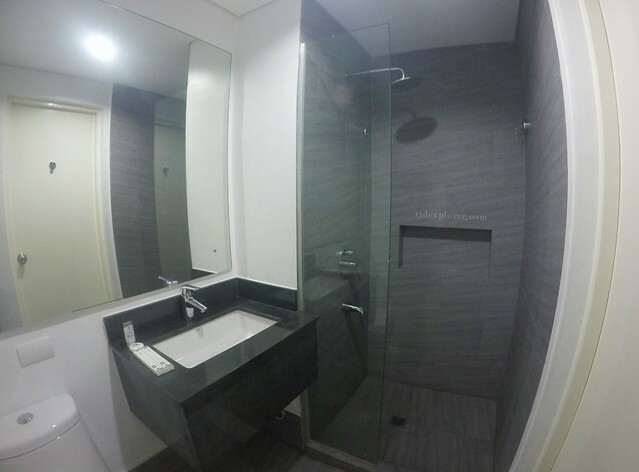 Towels and basic amenities were also present on the bathroom equipped with hot and cold shower on overhead rain spouts. Having a bidet was a major plus and put the hairdryer outside the bathroom was also a bright idea because it lessens the waiting time for the next user. I just hope they put a glass door or shower curtains to keep the water within the shower area and to avoid getting the entire flooring of the bathroom wet. View from the roof deck on the poolside. 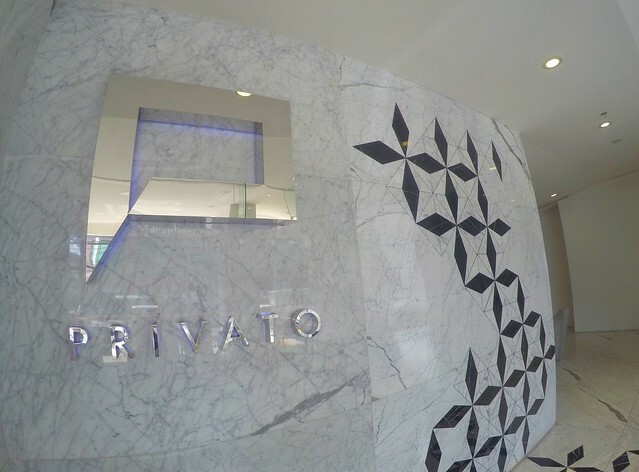 The 23-floor Privato Hotel, strategically located across Capitol Commons, has a total of 177 rooms of 4 different room types: Executive Twin, Executive King, Deluxe Double Queen, and One Bedroom Suite. 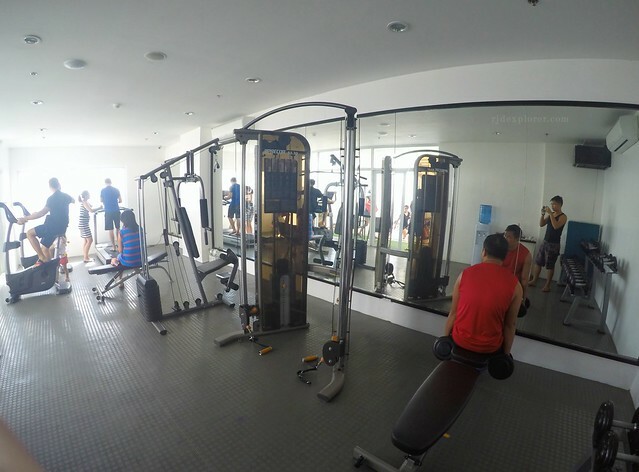 The roof-deck has three leisure facilities: swimming pool, gym, and a bar. 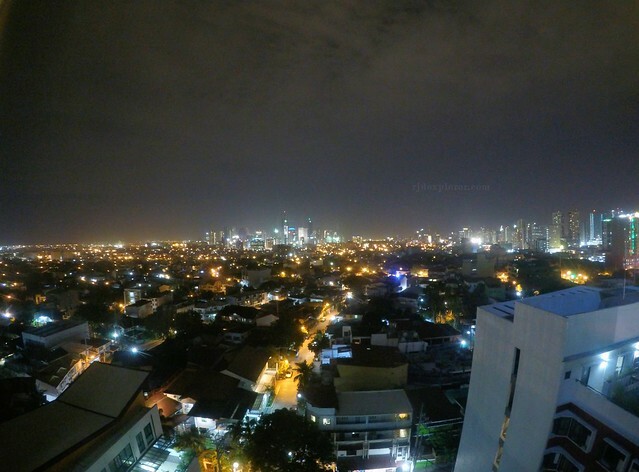 Verona Rooftop Lounge, aside from the food and beverages, offers a picturesque view of Makati and BGC in the evening. 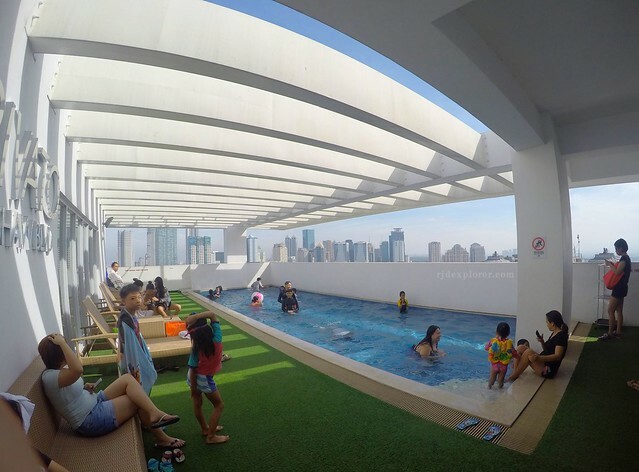 Privato Hotel’s swimming pool and gym available on the roof-deck. One of the things that the hotel promotes is the quality of sleep they offer because of their beds. When I told this to a friend and she asked me how I measure the quality of the bed, I said, “an unexplainable positive feeling when you wake up.” The next day, after an astoundingly 8-hour sleep, she validated the feeling. 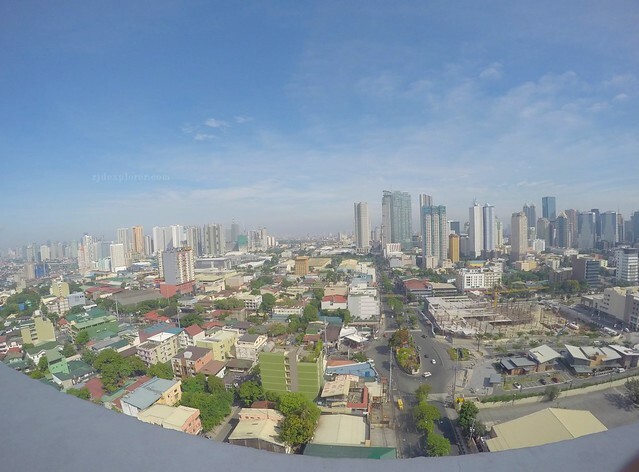 Aside from the sleep experience, we really enjoyed the view from our window, the scenic skyline of some cities in the metro. Window transforms into this view during the evening. 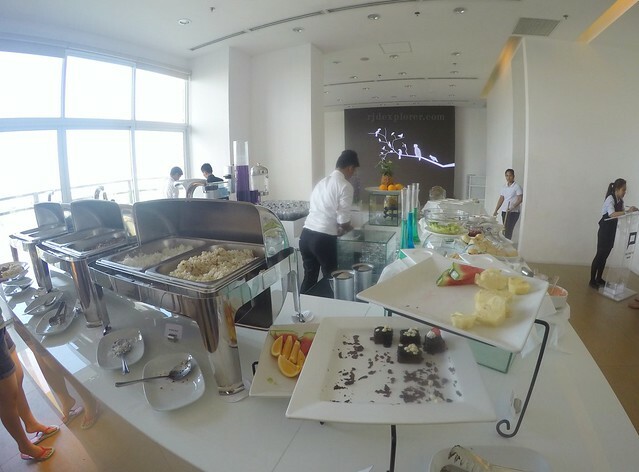 Breakfast is not included in their room rates as they give the guests the option of either availing the buffet or plated meals. Piazza Privato on the 6th floor is the one in-charge for this with its buffet counter situated in the center providing a view with its floor to ceiling window. The minimalist design of the restaurant was decorated with acrylic birds representing the country’s endangered species, and a stylized Mona Lisa portrait to harmonize the hotel’s Italian-theme. 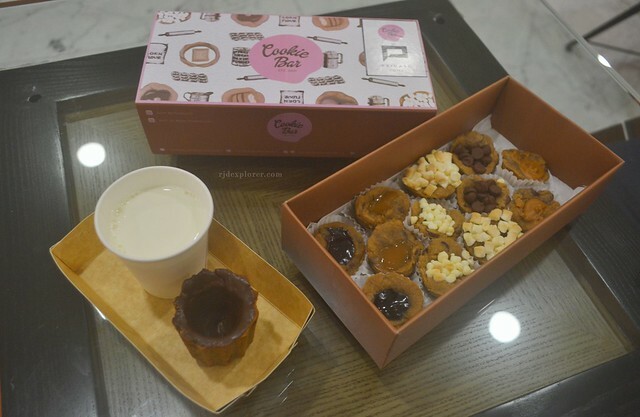 Cookie Bar Manila’s classic cookie cups and the superb cookie shot glass. Cookie Bar in the lobby offers classic and premium cookie cups with chocolates, peanut butter, and marshmallows on top, and the super cool cookie shot glass that comes with milk. Another thing that I think they could consider is the improvement on the servicing of the elevators. There are only two elevators that cater the 23 floors of the hotel and waiting time is kind of long for sometimes. After a long day of exciting food adventure in some restaurants along East Capitol Drive, we found ourselves in the comforts of our hotel room nursing our tummies, enjoying the cozy ambiance on our relaxing beds plus the impressive city view from our window. Booking a room in Privato Hotel was indeed a great deal on our journey to discover the food landscape in Kapitolyo, Pasig.